The much-anticipated follow-up to her 2013 feature Exhibition finds Joanna Hogg mining her own autobiography to craft a portrait of the artist as a young woman in early 1980s London. Caught between her dreams of becoming a filmmaker and her commitment to a toxic romance, 24-year-old Julie (an excellent Honor Swinton Byrne) comes home each night from film school to the Knightsbridge apartment owned by her mother (Tilda Swinton) only to discover some new, unpleasant surprise proffered by her boyfriend, Anthony (Tom Burke), a dandyish junkie whose sophisticated aura masks an abyss of selfishness and desperation. 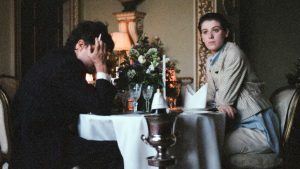 An eminently refined and moving bildungsroman about the ties that inexplicably bind, The Souvenir—as its title suggests—is also an absorbing evocation of a time, place, and national mood. An A24 release.